Next week The UNC-Chapel Hill Board of Trustees will unveil their suggestion for what to do with the Silent Sam Confederate monument. The fate of the statue, toppled by protesters in August, ultimately lies with the UNC Board of Governors, who will discuss the Board of Trustees’ plan at its Dec. 14 meeting. But Harry Smith, chair of the Board of Governors, has expressed confidence in the Board of Trustees. Earlier this month, the trustees requested more time to vet security for the several plans they’re still considering. UNC-Chapel Hill Board of Trustees Chair Haywood Cochrane would not go into any details, but suggested several final sites for the statue have been considered. UNC Chancellor Carol Folt is on record saying the statue does not belong in its former place as “the front door” of UNC. A new story from WUNC delves into the political past of William Keyes. Keyes is the only Black member of the board of trustees and a former paid political operative of the government of South Africa under apartheid. Keyes worked with the South African government in the mid-to-late 1980s. He was profiled in publications like the Washington Post and Business Week, and was a guest on CNN, the Today Show, the Charlie Rose show, and others. In those stories, Keyes was quoted using inflammatory language about those who were living under, and fighting, apartheid. In an appearance on CNN (and excerpted in the Washington Post) Keyes called Nelson Mandela’s African National Congress a “terrorist organization.” He also chastised African Americans as “hypocrites” if they supported non-violence during the American Civil Rights era, but were okay with Africans using violence in apartheid South Africa. Keyes claims he does not remember those comments but says the larger problem is that he is the only Black member of the board while there is a broad spectrum of opinion among Black people which he cannot alone represent. 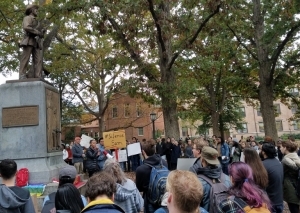 Many critics of the way the two boards have handled the Silent Sam matter agreed on that point. The UNC-Chapel Hill Board of Trustees meets and votes on the matter Monday at 8 a.m.